years, that she was an excellent teacher and mentor to so many young people. Just last week, I saw her of all places in the hair coloring aisle at Target so I decided not to bother her but now I wish I had. Sister Virginia was welcomed last night into the loving arms of her Lord and Savior, Jesus Christ the King. It’s no coincidence that she passed from this life to eternal life on the feast of the Presentation Of the Blessed Virgin Mary. In a reflection written by Paul Pennick taken from “Living Faith” a daily Catholic devotional, I found yesterday’s Gospel from St. Luke 21:2 very comforting in light of this tragic situation. It’s about Jesus noticing a poor widow putting in two small coins. The writer goes to say, “The story of the widow and today’s feast of the Presentation of the Blessed Virgin Mary seem somehow related. Here is a poor woman probably alone in the world reaching into her purse for her last two coins. She gave everything, her all to God. And God notices this. Like the poor widow, Sr. Virginia trusted in God and gave her all to Him. 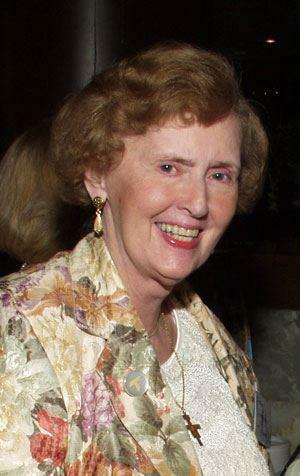 Sister followed in Mary’s example of giving her all to God through her service of teaching and being a wonderful role model of her Catholic faith, to her students at St. Joe’s High School for so many decades. She will be greatly missed by all who knew and loved her. May she rest in peace and dwell in the house of the Lord forever. Last but certainly not least, please also keep Jenny and her entire family in your thoughts And prayers during this most difficult and challenging time in the days and weeks ahead. God bless you all. St. Joe’s has and will always remain such a special part of my life. We are all part of that great big family, the Body of Christ and so feel so connected whether it be in joy or in sorrow.